Lots of people scrapbook! How many of us “Faithbook”? 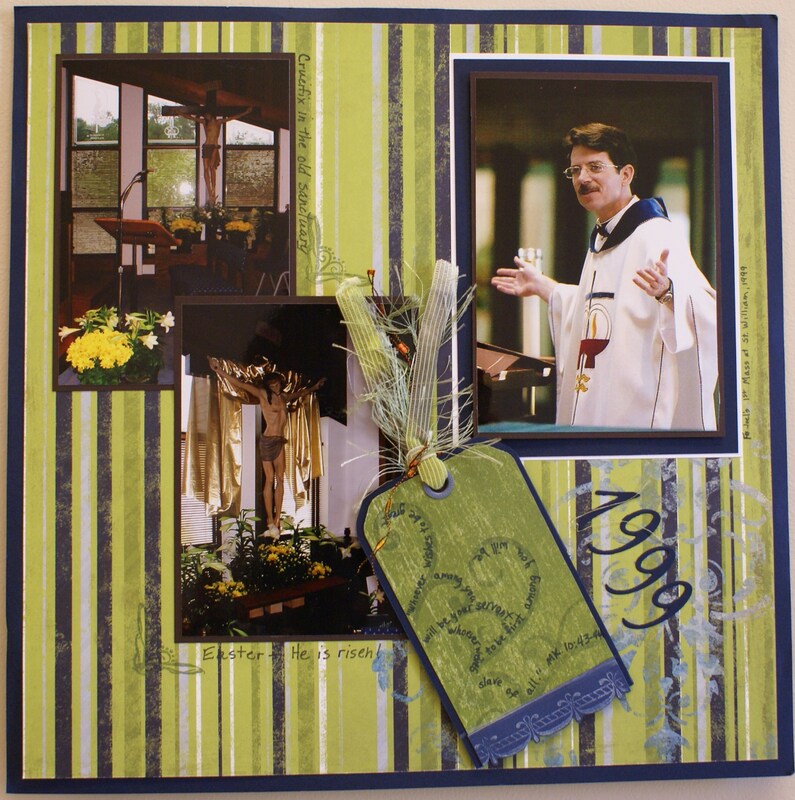 I would be willing to bet that there are a lot of people of faith who either do or would love to incorporate their faith into their scrapbooking. What do I mean by faithbooking? 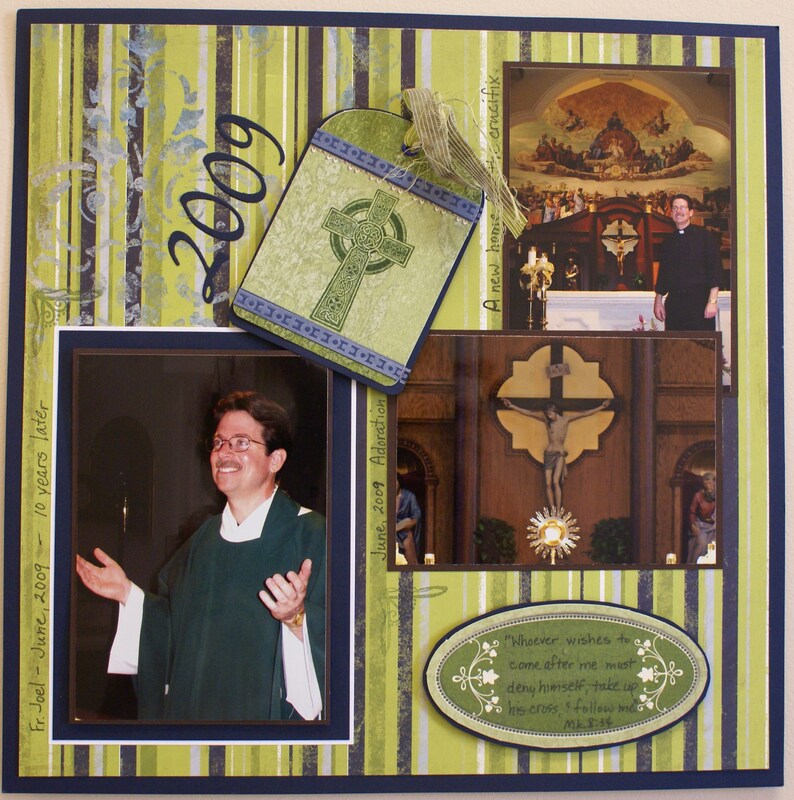 Faithbooking is basically scrapbooking with an emphasis on how an event has blessed our lives. It is a tangible way of looking at life through the eyes of faith. God blesses us every day and faithbooking is how we remember our God stories. 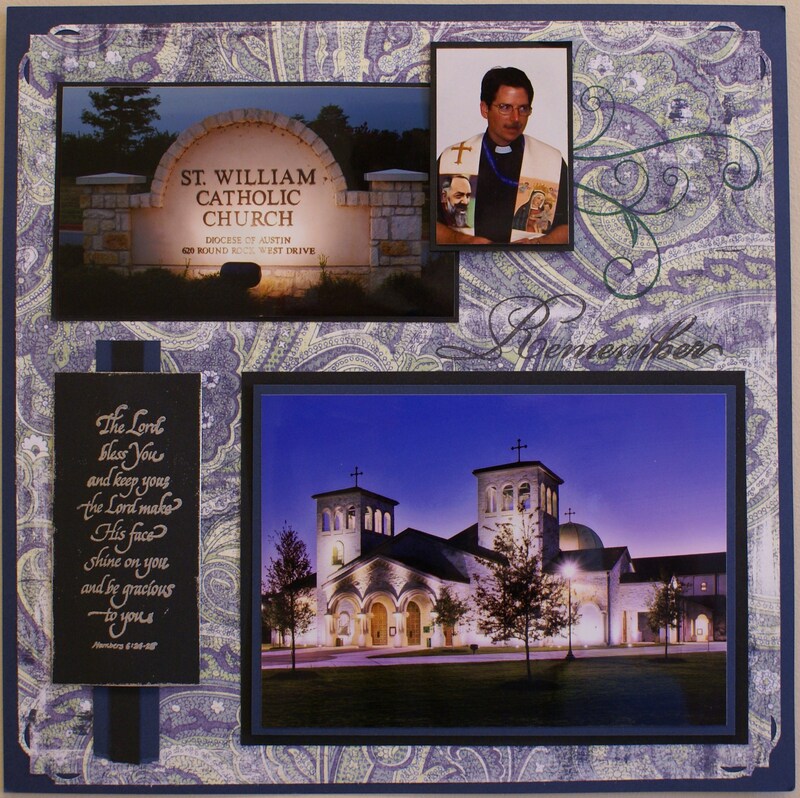 Just as a typical scrapbook is for us, and our loved ones, to enjoy and remember us, faithbooks offer us and future generations a wonderful way to look at the “God moments” they capture. We are called to see and remember life through the eyes of faith. Scripture often calls us to remember. Traditionally, God calls His people to remember an event by creating a ritual – an action for us to repeat again and again – to sort of re-member a special event. Ritual sacrifice reminded the people of God of the covenant between them and Yahweh. For the Israelites, the Passover meal recaptured the moments of God’s providence in the Exodus – setting the Israelites free from slavery in Egypt – and it reminds Jews to this day of God’s deliverance. In the New Testament, Jesus gave us a new command at the Last Supper – the Passover meal He celebrated the night before He died. And so at every Mass, Catholics remember through liturgical ritual the actions of Jesus at that First Eucharist which He forever united to the events of Calvary. Remembering through ritual makes the original even present to us in a special way. By faithbooking, we integrate our God stories into our being and pass them down to future generations. The process uses pictures and God’s Word to help us recall His action in our lives. Through the activity of pasting pictures and paper – using scissors to cut and ink to share God’s Word – we re-member our God stories and share them with future generations who learn from us Who our awesome God is. Once the faithbook pages are made, we remember the story through the ritual of looking at the pages. My hope for this blog is that the faithbook pages I create become a reminder to others that He is indeed the one who calls us out of darkness and into His marvelous light. He is an awesome God and there is no other. His deeds are indeed praise worthy!!! This page is from a memory album I helped make for our former pastor before he left. It was very therapeutic to make this memory album. We dearly love this priest whose one goal was to form us into disciples for Christ by helping us to become holy. We wanted him to remember all the good things about the community of St. William that he shepherded for 10 years. Service was often a focus of Fr. Joel’s homilies. This tag had one of the scriptures that he often used. During his 10 years as pastor, the parish moved from the location on McNeil Road to 620 Round Rock West Drive. The 1999 photos were taken in the church on McNeil. The 2009 photos were taken in the new sanctuary. In 10 years, Fr. Joel brought us a long way in our dying and rising with Christ! The Celtic cross is mindful of the Irish heritage of Fr. Joel. The scripture verse reminds us of how we must follow Jesus. It is what Fr. Joel did with us so well. This entry was posted in Faithbooking. Bookmark the permalink.